Thank you for coming to the Homepage of Tsuchiura First High School. Our school was established in 1897, the 30th year since the Meiji restoration, and this year is 120th anniversary of its foundation. Since then, our school became one of the most historical and traditional school in Ibaraki. The graduates exceeding 30,000 are making a contribution to many fields such as political, business and academic circles globally as well as domestically. The main building built in 1904 is selected for the National Heritage and currently under full refurbishment. It will be finished by the summer of 2018 after which the western Gothic style architecture will be restored. I deeply appreciate the supports by the graduates of our school for this restoration project. Our objective is to foster human potential with intelligence and the sense of humanity so that students become next leaders in Japan and the World. This is be achieved by bringing out students’ individuality and ability thorough our well-planned, highest level education program. Under the idea of what the school education ought to be, “Noblese Oblige – the responsibility of the elite”, our school is aiming at developing students’ potential to become leaders of society following a school motto, “independence”, “cooperation” and “responsibility”. One of the distinctive features of our school in recent years is SEG (the Science Explorers Group) program which was started with alumni support in 2009. This program provides the opportunity for the first and second grade students to have hands-on experience on cutting-edge science by visiting leading universities such as Massachusetts Institute of Technology and Harvard University and through the tours and discussion with scientists in these institutes. In addition, our school is selected for SGH (Super Global High school) program which is funded by the Ministry of Education, Culture, Sport, Science and Technology. This program is design to give students global perspectives by workshops, seminar, and field works with strong supports from the University of Tsukuba, Tsukuba Bank and City of Tsuchiura. Our students succeeded in entering to the most competitive colleges such as University of Tokyo (20 students) and medical schools (17 students in 2017) as a result of our education program. The intelligence and independent spirit the students learned at our high school will become significant asset for their entire life in society in addition to passing the exam to universities. Our school also put emphasis on the value of humanity which would be important for leaders in local, national, and international society. Following the school motto “Independency, Cooperation and Responsibility”, students plan and run events and club activities by themselves through student committee. This autonomous style is the tradition of our school. With this autonomous style, students organize three major events, Ichiko school festival, Ichiko Olympic and Walk rally. These activities shine lights on various aspects of students' life. For those who wish to enter our school, we welcome you as you have a big dream, full of curiosities and challenging spirits. We hope that you will become a person with intelligence and a sense of humanity who can make a significant contributions to your local community and national or international societies. You can find your bright future in our school. Our school was established in 1897, the 30th year in the Meiji period, and has a history and tradition that is over one century long. The main building is the former Tsuchiura junior high school which was built in 1903. This building was influenced in a western Gothic style. 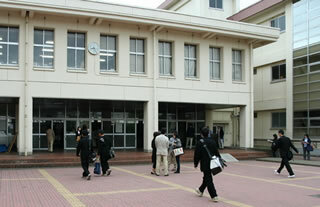 In 1976, it was the first high school building in Japan to be selected for The National Heritage. The building is open to the public once a month (second Saturday of the month). The total number of graduates since its establishment exceeds 30,000 including full-time and part-time students. Do you know the meaning of “Noblesse Oblige”? It is an old European proverb meaning “the responsibility of the elite”. The people who are highly educated and talented have an ever present obligation to contribute towards developing a better society. At this school, young people with strong motivation come together to study hard, build friendships, and develop the spirit of Noblesse Oblige to lead our country as the next generation. From Tsuchiura station, take the Number 4 or 5 bus. Get off at “Tsuchiura Ichiko Mae”. From Tsukuba center station, the bus leaves at 7:42 a.m. and stops at “Tsuchiura Ichiko Mae”. Copyright © Tsuchiura First High School, All rights reserved.